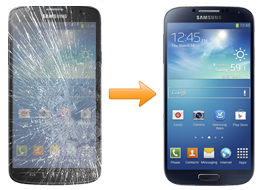 Fixspot offers professional and low cost Samsung Galaxy S4 repairs Melbourne CBD. We are located just ten minutes walk away from the Flinders Street train station. While our prices are low, the quality of our repairs is high. All our repair technicians are trained professionals with years of experience in their field. Minor repairs with us take only 30 minutes or less. If your Samsung Galaxy S4 repair is just one part, your repair will take under 30 minutes. Contact us by phone, email, or visit us in person at our Melbourne CBD store on Swanston Street. Hand your Samsung Galaxy S4 in to one of our friendly technicians over the counter, nip downstairs for a coffee, and pop back upstairs 30 minutes later to retrieve your phone. And if your Samsung Galaxy S4 repair is a little more complicated than just a one part repair, we will always let you know an accurate repair timeframe. If you need further information on our Samsung Galaxy S4 repairs Melbourne CBD, please don't hesitate to contact us.